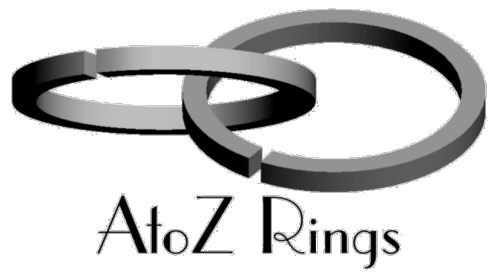 Extensive range of new moped piston rings from Achilles to Zweirad-Union. Typically only £8 a pair. There's a list of them all below. Selection of BL section Dykes rings, several sizes. Cyclemaster/Berini M13 26cc ring sets £8. NSU Quickly rings, 40mm × 2mm, A-slot, £8 pair. 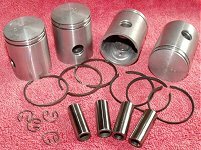 Mobylette AV10 NEW cylinder/piston set for reed-valve models—£60. Comprises NEW 39mm, 49.9cc cylinder and piston set with rings, G-pin, circlips and head gasket. Suit 51V models, etc. Anker–Laura M-48 first oversize 40.25mm piston sets—£30 each. Batavus GoGo, Pronto, Prius, Bronco, HS50, etc; BSA Ariel-3; SIM50; Ankermatic; etc. New piston sized 40.25mm (first oversize), pair rings, gudgeon pin, circlips. Benelli, Motobi, Yamaha FS1-E standard 40mm piston sets—£20 each. 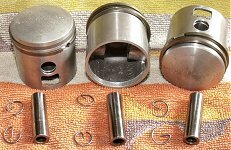 Piston, 12mm G/pin, 40 × 1.5mm C-slot rings & circlips. Height of piston at side 48mm, total height to crown 50mm. Height from top of g/pin hole to top edge of piston 17mm. Fit Yamaha FS1-E + 1950s–1960s Benelli and Motobi 50cc engines. We can source oversize sets upon request. Excelsior Sprite S1, Goblin G2, Brockhouse Corgi (dome-head 1946-56) 50mm bore. +0.010"–£60. NEW/old stock genuine Heplex 9479 piston sets (piston/rings/g-pin/circlips). Piston sets c/w 2.5mm B-slot rings, 10mm G-pin + circlips. Piston total height 61mm. 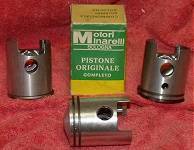 Minarelli / Fantic / Morini new piston sets—£20. 39.20mm ‘Sport’ set with BL-Dykes top ring and 1.5mm C-slot 2nd ring. New—£35. 39.60mm ‘Standard’ piston set with 2 × 1.5mm C-slot rings. New—£30. 39.80mm ‘Standard’ piston set with 2 × 1.5mm C-slot rings. New—£30. 40.00mm ‘Old Standard’ piston set with 2 × 2.5mm C-slot rings. New—£30. 40.00mm ‘Standard’ piston set with 2 × 1.5mm C-slot rings. New—£30. 40.20mm ‘Standard’ piston set with 2 × 1.5mm C-slot rings. New—£30. 40.40mm ‘Standard’ piston set with 2 × 1.5mm C-slot rings. New—£30. Mobylette AV3 49cc deflector-top piston sets. Piston c/w D-slot angle-cut rings, correct blind-end G-pin, circlips. 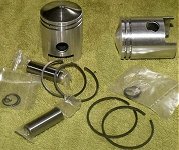 Mondial 49cc new piston sets—£40. 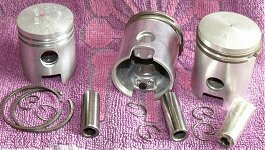 Piston with 39×2mm BL-slot (Dykes) top ring, 39×2mm C-slot 2nd ring, 12mm G-pin + circlips. Piston total height 51mm. No ports in skirt. 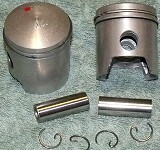 Piston with 38×2.5mm C-slot rings, 12mm G-pin + circlips. Piston total height 55mm. Original Italian Asso ref:1754. 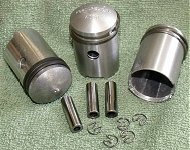 Peugeot 49cc new piston sets—£25. Piston sets c/w 2.5mm B-slot rings, 12mm G-pin + circlips. Piston total height 49mm. Puch Maxi/MS/Tomos, 10mm G/pin—£18 each. Puch Maxi/MS, 12mm G/pin—£18 each. Bretille piston (total height 44mm), rings 2.5mm C-slot, 10mm G-pin, circlips. 40.75mm (1st O/S)—£30. Nural-Kolben piston (total height 44mm), rings 2.5mm C-slot, 10mm G-pin, circlips. 40.75mm (1st O/S)—£30. Mahle piston (total height 44mm), rings 2.5mm C-slot, 10mm G-pin, circlips. 41.00mm (2nd O/S)—£30. Nural-Kolben piston (total height 44mm), rings 2.5mm C-slot, 10mm G-pin, circlips. 41.25mm (3rd O/S)—£30. 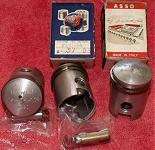 Asso 1017 piston (total height 44mm), rings 2.5mm C-slot, 10mm G-pin, circlips. 41.50mm (4th O/S)—£30. Kolbenschmit piston (total height 47mm), rings 2.5mm C-slot, 12mm G-pin, cirlips. 40.25mm (1st O/S)—£20. Mahle piston (total height 47mm), rings 2.5mm C-slot, 12mm G-pin, cirlips. 40.25mm (1st O/S)—£20. Vertex piston (total height 47mm), rings 2.5mm C-slot, 12mm G-pin, cirlips. 40.25mm (1st O/S)—£20. Kolbenschmit piston (total height 47mm), rings 2.5mm C-slot, 12mm G-pin, cirlips. 41.00mm (4th O/S)—£20. Kolbenschmit piston (total height 47mm), rings 2.5mm C-slot, 12mm G-pin, cirlips. 41.25mm (5th O/S)—£20. Vertex piston (total height 47mm), rings 2.5mm C-slot, 12mm G-pin, cirlips. 41.25mm (5th O/S)—£20. Kolbenschmit piston (total height 47mm), rings 2.5mm C-slot, 12mm G-pin, cirlips. 41.50mm (6th O/S)—£20. Vertex piston (total height 47mm), rings 2.5mm C-slot, 12mm G-pin, cirlips. 41.50mm (6th O/S)—£20. Sachs & Rex piston sets inc. full range of oversizes—£20. Suzuki M12/M15 Sportsman/M15D Sovereign/M30 piston sets in std. 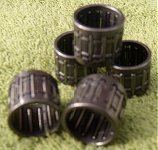 41mm, 1st O/S 41.25mm & 3rd O/S 41.75mm—£30. 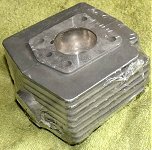 Old VéloSoleX 45cc deflector-top piston set. Asso number 594. 38.00mm (Standard) piston set c/w 38×2.5mm D-slot angle butted rings, 12mm G-pin + circlips—£30. Vertex piston for M50/M51 (total height 46mm), rings 2mm C-slot, 12mm G-pin, circlips. 38.75mm diameter (3rd O/S)—£30. Vertex piston for M50/M51 (total height 46mm), rings 2mm C-slot, 12mm G-pin, circlips. 39.00mm diameter (4th O/S)—£30. Kolbenschmidt piston for M50/M51 (total height 46mm), rings 2mm C-slot, 12mm G-pin, circlips. 39.00mm diameter (4th O/S)—£30. 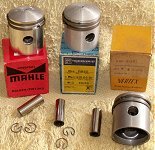 Mahle RO31 40L30-1 piston (total height 53.5mm, rings 2mm C-slot, 12mm G-pin, circlips. 40.25mm diameter (1st O/S)—£30. Villiers Junior (Deflector-top, up to 1939) 50mm std bore. NEW/old stock genuine Heplex 8158 piston sets (piston/rings/g-pin/circlips). Villiers Junior De Luxe (Flat-top, 1939-1949) 50mm std bore. NEW/old stock genuine Heplex 8575 piston sets (piston/rings/g-pin/circlips). Villiers VIII-D (8D) 122cc 1937. 50mm std bore. NEW/old stock genuine Heplex 5890 piston sets (piston/rings/g-pin/circlips). Piston height 2½". 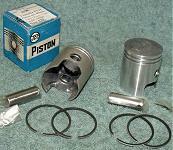 Yamaha FS1E piston sets (Std), £20. 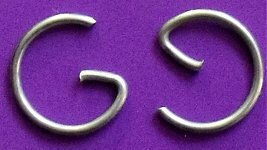 10mm × 1mm 'single-leg' wire circlips for 9mm gudgeon pin, suit Cyclemaster, etc—£1.80p pair. 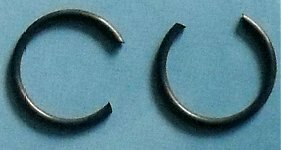 12mm × 1mm 'open-C' wire circlips for 11mm gudgeon pin—£1.80p pair. 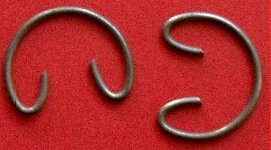 12mm × 1mm 'single-leg' wire circlips for 11mm gudgeon pin—£2 pair. 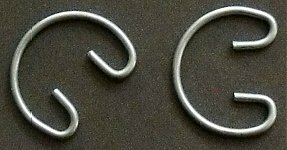 12mm × 1mm 'double-leg' wire circlips for 11mm gudgeon pin—£2 pair. 13mm × 1mm 'Eye' type plier circlips for 12mm gudgeon pin—£2 pair. 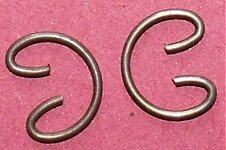 14mm × 1mm 'single-leg' wire circlips for 13mm gudgeon pin—£2 pair. 15mm × 1mm 'double-leg' circlips for 14mm gudgeon pin, Raleigh RM1, RM2, Trojan Mini-Motor, etc—£2 pair. 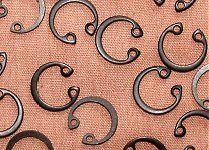 16mm × 1mm 'double-leg' circlips for 14mm gudgeon pin—£2 pair. Small-end bearing 13.I/16.O/14.L; Motobécane/Mobylette, etc—£8 each. 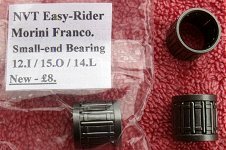 Small-end bearing 12.I/15.O/14.L; NVT Easy Rider/Morini Franco motor—£8 each. Broken fin restoration on cast iron and alloy cylinders and heads. Rebore and hone £30 per cylinder. Spark plug 14mm thread Heli-coil service £20 per insert.